Chapter: Black Women, Religious Rhetoric, and the Legacy of Abraham Lincoln. Myers, Amrita Chakrabarti. 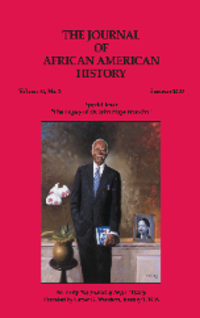 “BLACK WOMEN, RELIGIOUS RHETORIC, AND THE LEGACY OF ABRAHAM LINCOLN.” The Journal of African American History, vol. 94, no. 4, 2009, pp. 561–570. www.jstor.org/stable/25653979.